The Capra Demon resides in the Lower Undead Burg. It is a lesser demon resembling a human with a goat's head, wielding two large machetes. He has two Undead Attack Dogs with him. Nakamura: Before we move on, I'd like to ask you about the Demon enemies I designed, specifically those designs which incorporate some type of symbolism. I know that you dislike designs which are too easy or obvious, but spending too much time trying to force symbolism into designs can be just as damaging to the development of the world. So I just wanted to know how you feel about the demon enemies overall. Miyazaki: I think you're thinking too much of it. To put it plainly, I'm delighted with your designs. It can be difficult to achieve the right balance of symbolism in designs. It's true that I dislike designs which are too obvious but there are times when I feel a design lacks a certain something. At times like this I have been known to look through the reference materials, pick out things I like and simply stick them on. 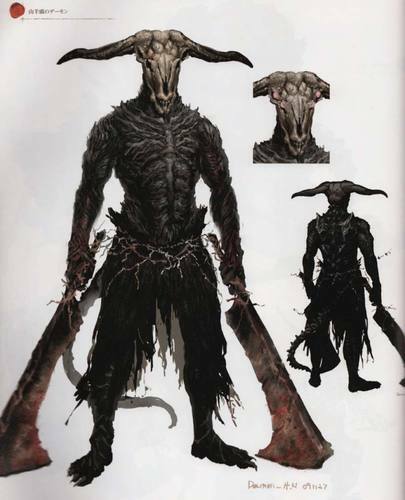 The Capra Demon's head is an example of this, it gives a sense of ceremony and long-held tradition, which in turn hints at a developed culture. Details such as this can really improve designs by giving them a significance not present at first sight. Symbols contain inherent meaning, they wouldn't be symbols if they didn't, but it's difficult to add new meaning to that symbol. So I think this can be a really powerful weapon for the artists. Anyway, getting back to your question, I think you did a fantastic job. Nakamura: I'm relieved to hear you say that. Miyazaki: Really? I wish you wouldn't talk like that, it's almost like you're scared of me. The lesser Capra demons use these greatswords in pairs. The blade is cast iron and hooked. The sword is imbued with no particular magic, but for those who have the strength, its great weight will smash foes mercilessly.